Designed for heating and passing DEF throughout SCR system on commercial vehicles, SCR Hoses use nylon core tubes for on-vehicle DEF transfer. Eliminating problems of condensation, coagulation and freezing of liquids inside hose, unit uses extruded sheath to lock-in heating elements and provides uniform heating for longer time. Hoses are available in 4mm and 5.5mm EPDM cores and 6mm nylon core I.D and are electrically and pressure tested. 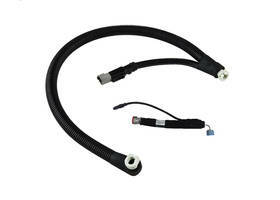 The Parflex Division of Parker Hannifin Corporation, the global leader in motion and control technologies, now offers a standard line of SCR Hose for on-vehicle DEF (diesel exhaust fluid) transfer with EPDM or nylon core tubes to meet new Tier IV specifications to be implemented in 2018. SCR hoses are heated hoses designed for heating and conveying DEF throughout the SCR (selective catalytic reduction) system on commercial vehicles. The patented design of the heated fitting eliminates problems associated with low ambient temperatures, such as condensation, coagulation or freezing of liquids within the hose. Unlike competitive electrically heated hose, Parflex SCR hose locks in the heating elements with a patented, extruded sheath for added protection and long-lasting uniform heating. The hose and fitting assemblies are optimized based on customer performance requirements and dosing system specifications. The thermal performance is balanced to ensure even heating throughout the assembly length and power densities can be customized for different dosing control systems. The thaw performance and final hose assembly lengths are limited only by the maximum available power of the dosing system. Standard assemblies are available with a 4mm (EPDM core), 5.5mm (EPDM core), or 6mm (nylon core) I.D. Each assembly is electrically tested, pressure tested and cleaned before shipment. Parker’s EPDM-core and nylon-core SCR hoses will be on display in Parker booth #S-8242 at IFPE2017, March 7 - 11. For additional information, contact Matt Peter, global sales manager, at mpeter@parker.com or call 330-298-4032. Based in Ravenna, Ohio, the Parker Parflex Division manufactures a wide variety of thermal products, including Thermoplastic and PTFE hose and tubing for the most extreme applications on the planet. In addition to standard hose and tubing products, Parflex engineers solutions for diverse applications, including construction, aerial lift and agriculture equipment.